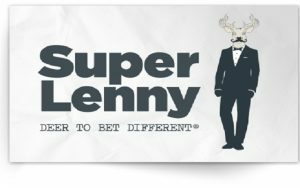 The Super Lenny online casino may not be as flashy looking as some of the others but you will be quick to recognize it with its icon Deer Lenny. This icon supports the casino’s motto of “deer to bet different’. This casino appeared online in 2014 and since then has been gaining in its popularity. Betit Operations Ltd. is the owner of this online casino which is a Maltese company that is part of the Betit Group. There is a great selection of casino games to be enjoyed here at the Super Lenny online Casino. These include a variety of table games, great slots including video slots,bingo, scratch cards,racing games,along with several others. Slot lovers get to choose from close to 400 slot games. For table game enthusiasts there are 71 table games to keep you going. Video poker gamers can choose from 30 games. For those that love the excitement of live casino games, then Super Lenny can offer you 20 live casino games to choose from. When landing on the main casino site visitors have the option of going from the casino to the live casino as well as to the other Super Lenny offerings concerning sports and live sports. Everything that Super Lenny has to offer is only a mouse click away. With about 500 games being offered at this online casino, added to the fun is the selection of casino game software providers that Super Lenny has brought in to support their gaming platform. These include NetEnt, Play’n Go, Microgaming, Playtech, Big Time Gaming as well as others. For player protection and security the Super Lenny online casino uses SSL encryption algorithms. Super Lenny offers a great welcome bonus. On your first deposit of £20 or more, you will receive a 100% match bonus up to £150. Plus 50 free spins. On your second deposit of £20 or more Super Lenny will provide a 50% match bonus up to £300. Plus 50 free spins. Then if you place £350 worth of bets on slot playing you will get 50 extra free spins. Be sure to read the terms and conditions so there are no misunderstanding about the rules regarding your bonuses and free spins. For those that are on the go and still want to enjoy the fun and excitement that the Super Lenny online casino has to offer there is a mobile version to do this with. This version of the online casino offers 55 mobile games for your enjoyment. You can access the Super Lenny mobile casino from your Smart Phone or tablet. Once you join Super Lenny via their casino platform it will automatically give you the access to use the mobile version with the same account. You will be eligible for the same welcome bonus and promotions that are available at the main casino. Depositing at Super Lenny online casino will not be a problem as there are several options such as Maestro, MasterCard, Neteller, Paysafe Card, instaDebit, Visa, iDEAL, Sofortuberwaisung, POLi, Euteller, Trustly, Skrill, PugglePay, Skrill, and 1-Tap. When you are ready to withdraw you can use such methods as Bank Wire Transfer, Neteller, instaDebit, Visa, and Skrill. Be sure to check the latest terms and conditions for withdrawals for minimum and maximum amounts. Good customer service is important to both new and experienced online casino players. Here at the Super Lenny online casino, there are several options to present queries or concerns. They can be reached via email or telephone. Chat is available with scheduled times. The customer support team has the reputation for being courteous and helpful in finding the answers required for queries and addressing problems brought to their attention.